When John and I planned on adopting children, I knew that I wanted to homeschool them. I homeschooled our oldest three from preschool through high school and it was a wonderful experience. Yet homeschooling my adopted kids didn’t happen as easy (or as quickly) as I thought. Homeschooling Alyssa from preschool age was no problem. We adopted her as a newborn from a private placement. Yet adopting from the foster care system, and homeschooling Casey and Bella, has been a different story. Our state had a say. The State of Arkansas told me that homeschooling foster children is not allowed. Even though we had an adoption plan for Casey and Bella, they were considered foster children until the adoption was final. For us, this took just over six months. This meant I couldn’t homeschool for six months. We used private school to start. Since I couldn’t homeschool Bella, I found a wonderful private school, Aspire Christian Academy, for special needs kids. Because of all she faced in her past, Bella was considered special needs. The teachers were godly, wonderful people who poured in to her life. They knew how to handle her unique needs and they cared for her greatly. We saw Bella grow and heal in her time there. It was a great schooling choice for us. We tried not to change too much, too soon. When we got Casey he’d been in an all-day daycare. I was used to having my children at home, and it seemed unnatural to me to take him to daycare for most of the day. Instead of daycare—with the help of our social worker—I found an all-day center where Casey could get all of his therapy (speech, occupational, and physical). It took a lot of self-talk to remind myself this was okay. Casey needed the therapy. It also helped him to keep things “familiar” for a while. To him, going to preschool all day was normal, even though it didn’t feel that way for me. Gradually, I kept him home more and more until home became the familiar and safe place. After nine months Casey didn’t need as much therapy, and he was home full-time! I had to ax the guilt. Of course, making these schooling choices for my kids meant I had to ax the guilt. It was okay that my daughter was being educated outside of the home. I wasn’t compromising by enrolling her in school. Instead of feeling guilty, I looked at this school choice as something we were doing for a season. Casey was receiving the therapy help he needed and Bella was too … in a Christian classroom. When this season came to a close, Bella came home, and we were both ready for it. We took things slow. It’s been 2 years since we brought Casey and Bella home and this school year I started homeschooling all three of my little kids, all day, at home. I’m so glad now that I took things slow. I realize the most important thing was that we all had time to adjust. Bringing new children into a home takes a lot of adjustment. Homeschooling them does, too. Just because you believe homeschooling is the best choice doesn’t mean it’s the best choice for your adopted kids, today. Seek God and ask Him to help you with your children’s unique path. Just like homeschool curriculum, your adopted child’s journey to homeschooling can be tailor-fit to their needs. The best way to homeschool adopted kids is in a way that meets their unique needs and allows them to adjust to your family and your homeschooling lifestyle over time. 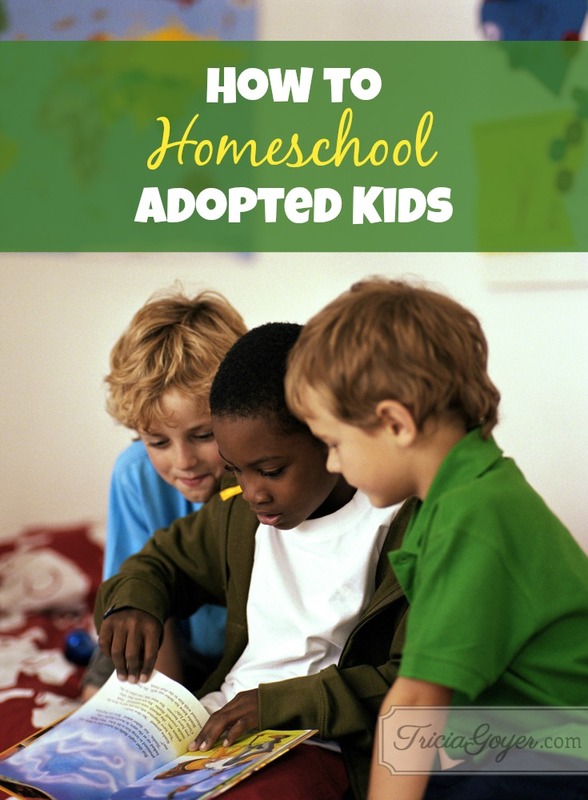 Are you a homeschooling parent of adopted kids? What tips have you learned along the way? Share in the comment section below! I’ve been following you on Facebook and know your family is growing. Will you give the “middles” the option of being homeschooled even though they are older? I know normalcy plays a big role, too. Would love to hear your thoughts on potentially homeschooling older adopted children. just clicked over from pinterest…wondering your thoughts on how you bring POC around your homeschooled kiddos…I homeschool our kids, including one child of color and find homeschooling to be isolating in terms of other people who look like her. any advice/thoughts? thanks! Love this! After homeschooling for many (many) years, including my four youngest, adopted children, the three remaining school-age children are no longer homeschooling (though one is doing an online public school program so it is kind of a blend). And though I have had regrets and am still a huge homeschool proponent, I agree with you that sometimes it is not what is best for that child/family at that moment. And the mom-guilt had to go. It has been humbling for sure, and I cringe to think of myself as being judgemental when others made similar decisions to stop homeschooling in the past (oooh, I really don’t like that about myself but it’s the truth). I love homeschooling when it is right. I also know that it may not be right for everyone for various reasons. Thank you for sharing!